The 2008 CASI Alouette Award has been conferred to the MOST Team in recognition of the project’s outstanding contribution to the advancement of Canadian space technology, applications, science and engineering. On June 30, 2003, Canada’s first Canadian-built science satellite in over 35 years was launched into space. 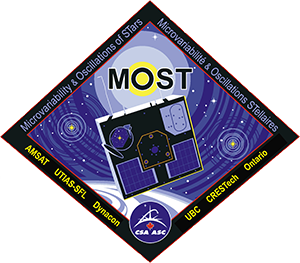 By successfully carrying out its goals, the Microvariability and Oscillations of Stars (MOST) mission has achieved unprecedented pointing accuracy for a microsatellite and allowed university and private sector participants to develop skills and technologies that will be of benefit to Canada in future programs. In the first year of operations, the MOST team made improvements to on-board software that now allow up to 30 stars to be observed simultaneously versus the original goal of observing one at a time. The MOST mission has gained international recognition for its achievements and has helped Canada become a world leader in microspace missions. It has contributed to scientific knowledge and raised new questions about stellar structure and dynamics. The satellite has been first to make several astronomical discoveries that have shaken the scientific community. It has accomplished all this with a very modest budget compared to similar missions – 10 million dollars to develop and launch.